How Do You Unblock Yourself From Someone’s Facebook Account if They Blocked You? Help answer questions Learn more. Think about your relationship with that person and try to come up with any reason why they might not be happy with you. Doing so will unblock your selected user. And you should then ask them to please unblock you. Get great tech advice delivered to your inbox. What do I do if I have followed all the steps, but I can't get to the screen to tap unblock? If you have a mutual friend, message that friend and ask them to ask the person that blocked you to unblock you. Maybe they can do that or at least find out more information about why you were blocked in the first place. Next send a friend request from all the 3 accounts to the victim and you should be clever enough that your request must be accepted. After that, Facebook will suggest to recover password by existing email address. Next, Facebook will ask a secret question if the victim has one , you also need to bypass that by entering the wrong answers three times. After that, Facebook will try to help you recover the password by the help of 3 friends and here comes the loophole. After doing this you will get the verification code on your fake profiles, with those 3 codes you can easily change the password. The fake account must be friend with that person with at least 3 weeks and all 3 accounts must not be mutually friends. Here is what Facebook says to do. I am temporarily blocked from Facebook. Please look at the article on this page to find out how to get unblocked. I am blocked from face book for using my pen name. How do I get back using the social media using my pen name? Take the hint and leave them alone! Notify me of follow-up comments by email. Notify me of new posts by email. This site uses Akismet to reduce spam. Learn how your comment data is processed. July 26th, by fbhelper. It's a blue button on the left side of the page. Doing so will unblock your selected user. If you want to re-block the user, you'll have to wait for 48 hours before you can block them again. Go to Facebook's website. If you're already logged into Facebook, doing so will open your News Feed. 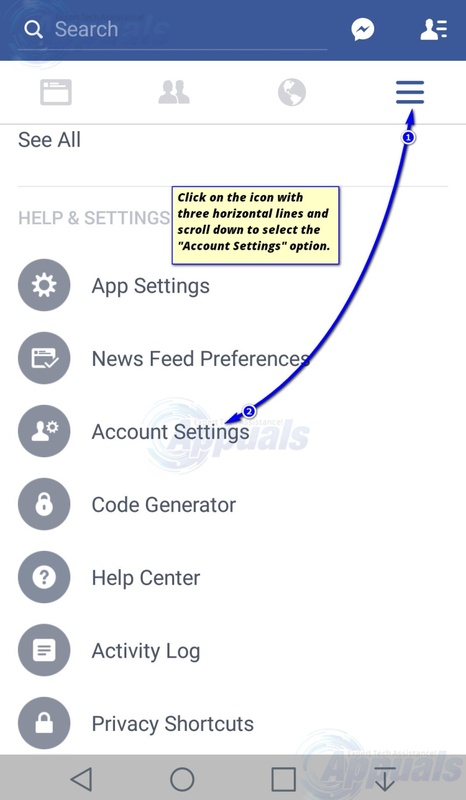 If you aren't logged into Facebook, you'll first enter your email address or phone number and password in the upper-right side of the page. It's in the top-right side of the Facebook window. This option is near the bottom of the drop-down menu. It's a tab on the left side of the page. Click Unblock to the right of someone's name. You'll see the name of each person you've blocked in the "Block users" section of this page. Click Confirm when prompted. Go to setting and select blocked and whoever you want to unblock. There will be a tab that says unblock, select that and you can send them a friend request. Not Helpful 22 Helpful Go to your Facebook settings and click on the Blocking button. Scroll through the list of blocked users until you find your friend's name. Press the Unblock button. You will then have to send them a friend request if you want them back on your friend's list because once you block someone, that also takes them off of your friend's list. If the person's profile is public, you can view it by logging out of Facebook and searching for his or her name. Not Helpful 25 Helpful 9. Click on the drop down arrow at the top right of the home page, and select 'Settings. Not Helpful 16 Helpful 6. I unblocked someone, but it won't put them back on my friends list. How can I fix this? You need to send them a friend request again. If they accept your request, you will become friends and then they will appear on your friends list. Not Helpful 4 Helpful 2. You would have to log into their account and remove your name from their list of blocked individuals. There's no way to unblock yourself without having access to that user's account. Not Helpful 4 Helpful 1. No, they will not receive a notification. They will eventually find out that you unblocked them. To unblock someone in your blocking settings. Click at the top right of Facebook and choose Settings. ; Go to the left side of Facebook and click Blocking; In the Block Users section you should see a list of people you've blocked. Click Unblock next to the name of anyone you want to unblock. ; Tap Unblock next to the name of the person you want to unblock. After you block someone on Messenger, you can unblock them if you want them to be able to send messages to you again. 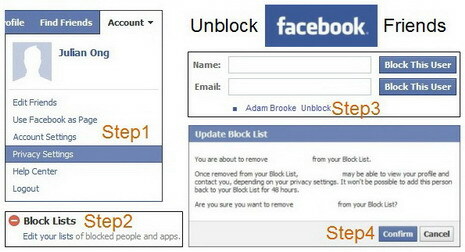 Here are the simple steps on how to get unblocked on Facebook / Messenger. Follow what is listed here to help get unblocked.